Every year world diabetes day is celebrated on 14th of November. This year Wellness Diabetes Speciality Clinic is dedicating World Diabetes Day to children suffering from Type 1 Diabetes, as they are future of our nation. Young people with Type 1 diabetes need to inject insulin or get insulin delivered by a pump on a daily basis in order to survive. Each day is a balancing act between the amount of food eaten, exercise taken and insulin injected to maintain a safe blood glucose level. This can be difficult for children, young people and their families to manage which is why support from us is so important. Keeping child physically active and hence maintaining healthy weight. Watching out the food intake. Here is an intresting recipe which will surely liked by the child. Open up an exciting new experience of healthy and tasty dining for your children, with this sumptuous Falafels in jowar pockets. Jowar contains zinc that is a great immune booster, folic acid that is a blood synthesizer. These multi-nutrient pockets are filled with shredded veggies mixed with curd, making it a sumptuous, healthy meal. Indulge without guilt! Sieve the jowar flour and salt together in a bowl. Add enough lukewarm water and knead into soft dough. Wet your palms and flatten each portion into a circle. Heat a non-stick tava (griddle) and roast it on both sides till brown spots appear on both the sides. Repeat with the remaining portions to make 5 more pitas. Keep aside. Drain the kabuli chana and blend it in a mixer to a coarse paste, using enough water. Combine all the ingredients including the kabuli chana in a bowl and mix well. Divide the mixture into 12 equal portions and shape them into a flat, oval patties. Heat a non-stick tava (griddle) and cook each patty, using ¼ tsp of oil, till it is golden brown in colour from both the sides. Drain on absorbent paper and keep aside. Divide the salad into 12 equal portions and keep aside. Cut the jowar pita into half so that they form pockets. Warm the halves on a hot tava (griddle). 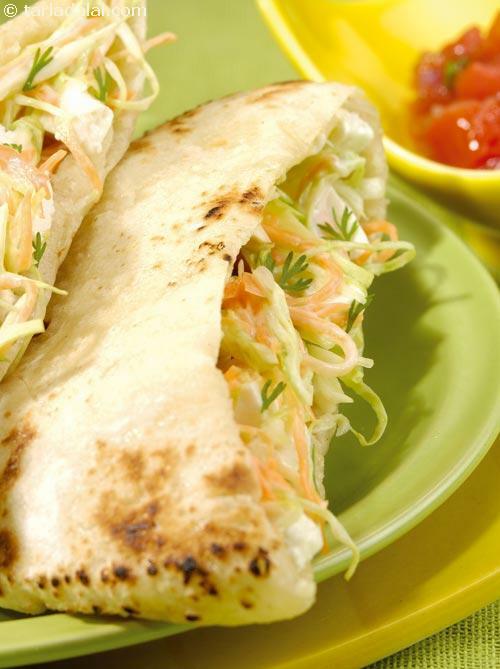 Fill each pita half with one patty and a portion of the salad. Repeat with the remaining pitas, patties and salad to make 11 more pita pockets.